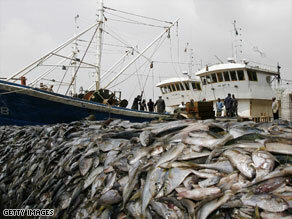 Efforts to curb overfishing in five of the world’s marine ecosystems are starting to show signs of working. The news comes from a multi-national study on the status of marine fisheries and ecosystems reported in “Science”. While the report found that stock collapse is an increasing international trend, the scientists involved believe there are positive signs that rebuilding the ocean’s depleted fish stocks is possible. The two year study looked at ten marine ecosystems, evaluating how much marine life was being fished and which management techniques have been used to rebuild depleted stocks. It is a follow-up to a 2006 paper that highlighted a widespread global trend toward fisheries collapse that led to disagreement among the scientific community. The study found signs of some stock recovery in waters around the U.S., Iceland and New Zealand, supporting the argument that well managed fishing can lead to rebuilding fisheries in other parts of the world. “These highly managed ecosystems are improving” said Ray Hilborn of the University of Washington and one of the report’s lead authors. “Yet there is still a long way to go: of all fish stocks that we examined sixty-three percent remained below target and still needed to be rebuilt.” “Across all regions we are still seeing a troubling trend of increasing stock collapse,” said Boris Worm, of Dalhousie University and co-author of the report.